These former apartments are now restored and are Condos. Luxury and elegant vintage homes? We think that be may be the ultimate combination in a home! 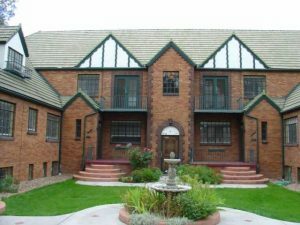 If you are a history buff like I am, one of the great things about Denver is the enormous number and variety of old, distinctive, beautiful, heirloom and historic houses, buildings and warehouses still standing, and in most cases preserved and restored. These wonderful old buildings are responsible for the whole LoDo Loft explosion in Denver and each one has its unique qualities, style and character. Many residents and groups like Colorado Preservation Inc have devoted a great deal of time, energy, money and resources to help keep our history alive. I arbitrarily chose the latest date as 1930 as my first car was a 1930 Model ‘A’ Ford Coupe, and no it was not new when I got it!…..yell at me if you feel the date should be earlier or later! Update – 4/9/12: A number of clients, customers and friends told me to go to 1935 or 1940 as there are so many beautiful homes and buildings built in the 1930s, so 1940 it is! Note: In changing the date of the search inquiry, there were 516 properties built on or before 1940 for sale – that’s a lot! To make searching easier, there will be searches set up on price ranges, MLS Areas, date built and styles in the menu above. The home searches will include single family homes and buildings – apartments and warehouses etc that were converted to condos and lofts, as well as condos and townhomes originally constructed for that purpose.